Luis and Tuesday are winning hearts again. With his captivating New York Times bestseller Until Tuesday, Iraq War veteran Luis Carlos Montalván furthered America's conversation about the need to care for first responders suffering from the effects of PTSD, especially highlighting the near-miraculous benefit of service dog companionship. Now, in this spectacular follow-up, Luis and Tuesday rescue a forgotten Tuskegee airman, battle obstinate VA bureaucrats and bring solace for troubled war heroes coast-to-coast. All this, while Luis' personal battle intensifies; while Tuesday has helped him make immense mental strides, the chronic pain of his injuries threaten to leave him wheelchair-bound. In a grave decision, Luis opts to amputate his leg, and learn how to live with a prosthetic. As Luis regains his athleticism, 10-year-old Tuesday enters new phase in life; due to his growing age he will soon need to retire. Together, these two friends begin the tender process of welcoming a new puppy into their pack. SINCE TUESDAY is an inspiring story with an unforgettable message about love, service, and teamwork. Luis Carlos Montalvan was a captain in the U.S. Army who served two combat tours in Iraq, where he earned the Combat Action Badge, two Bronze Stars, and the Purple Heart. 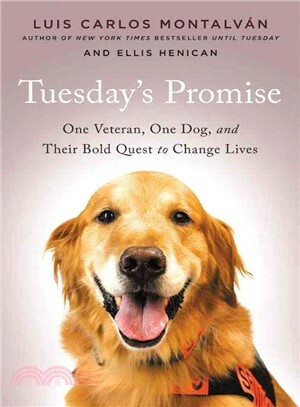 He is the bestselling author (with Bret Witter) of Until Tuesday: A Wounded Warrior and the Golden Retriever Who Saved Him and two books for children, Tuesday Tucks Me In and Tuesday Takes Me There. He and Tuesday advocated for veterans and others with disabilities, tirelessly promoting the virtues of service dogs. Ellis Henican is a journalist and TV pundit and the author of four New York Times bestsellers. His website is henican.com.